I eat my Spaghetti-os on. against each other. My mother is laughing. created by my spilled milk and spit. the Pussycat Dolls do. I am a girl. I am a doll, some higher power is in control. that lives in my back yard. A bowtie for special occasions. and pink button down shirts. green. My kisses have no effect. Copyright 2008, Ashley Shivar. © This work is protected under the U.S. copyright laws. It may not be reproduced, reprinted, reused, or altered without the expressed written permission of the author. 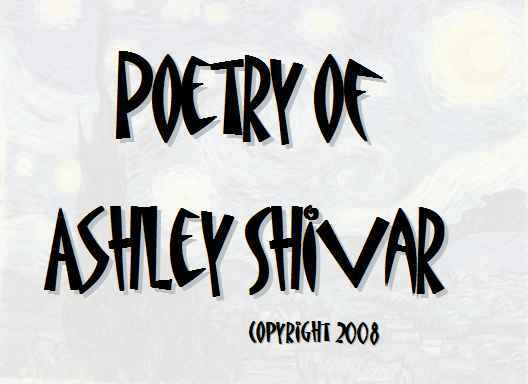 Ashley Shivar is currently a MFA student at UNCW studying poetry. She graduated with a BFA in Creative Writing from UNCW in 2007. She is the co-coordinator for the Writers In Action program which allows UNCW MFA students to teach in public schools and community programs in the area. She is also the current President of the CRWGSA at UNCW. Her poem "Commodification" won the 2nd place prize for The Lettered Olive Undergraduate Literary Review in Spring 2007, volume 5, issue 1. Currently, her poem "Keramikos" is being displayed in Randall Library of UNCW above the pottery exhibit. She also had 3 poems appear in Atlantis, the Creative Journal of UNCW. One, "Summer Afternoon Commute," won the Sam Regan Award in Spring 2005.